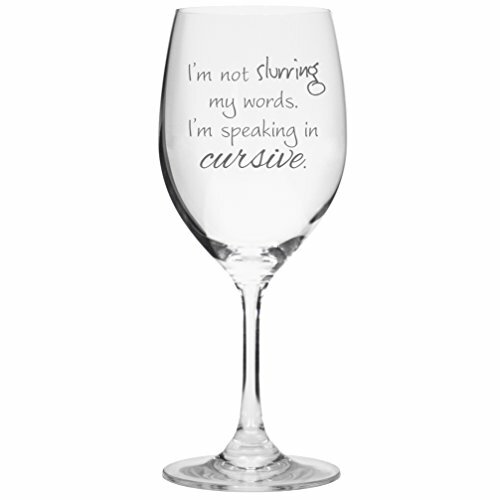 I'm Not Slurring My Words I'm Speaking in Cursive Wine Glass - Moar Stuff - You don't need it but you know you want it. ★ For the wine lover of the utmost class & sophistication, yet also an appreciation for funny wine glasses. ★ High quality, large, 16 ounce, stemmed wine glass. ★ Etched Text (Not Printed!) - The text is etched into the glass and guaranteed to never wear off! 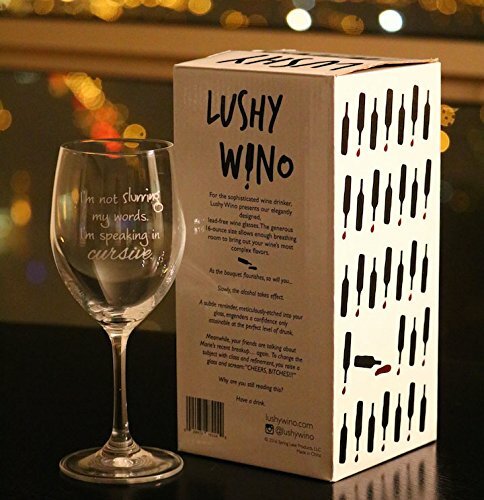 ★ Makes a great funny wine gift for your sister, aunt, coworker, boss, or teacher! Individually gift boxed in an attractive, humorous box that everyone will love. ★ Dishwasher safe! Great for daily use. “I’m not slurring my words. 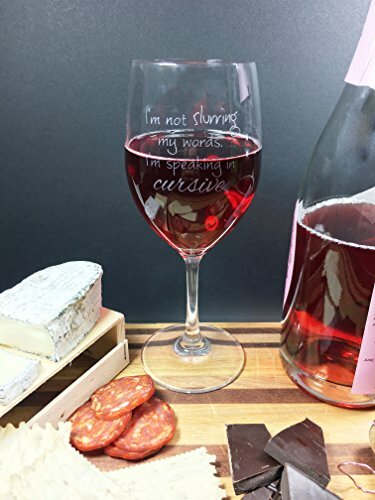 I’m speaking in cursive.” A gentle reminder, meticulously etched into this stemmed glass so that it never wears off, that will add a sense of refinement and humor to every occasion. Yet, this wine glass isn’t just a cheap novelty. Ok, it IS a novelty but it’s also functional, dishwasher-safe glassware. It’s perfect for use as your daily wine glass. The generous 16-ounce capacity allows wine to breathe and fully develop the rich bouquet of flavors you would expect from fine crystal….. Oh, who am I kidding? You don’t care about that kind of stuff. You just want the wine to taste good and the company to be fun, right? 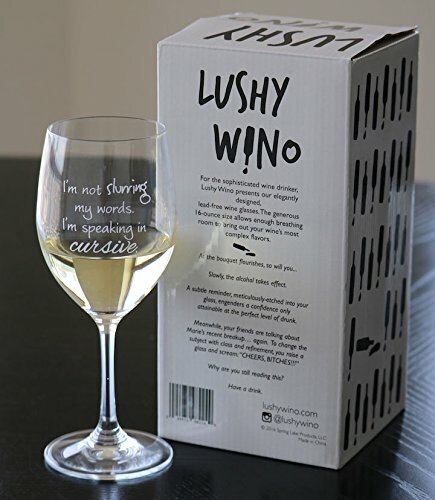 Well, this wine glass will make people smile while you drink the pain away for another night. If that’s what you want, get this glass, you’ll be glad you did every time someone smirks when reading it. It also makes for a humorous and useful gift that will keep your girlfriends, mom, sisters, colleagues, enemies, former lovers, and even Diane from purchasing thinking of you for years to come and mostly in a good way. Dimensions: 10 x 5 x 5 inches. For the wine lover of the utmost class & sophistication, yet also an appreciation for funny wine glasses.